The Rindge, New Hampshire, campus of Franklin Pierce University is a safe haven for students suffering after Hurricane Harvey. Thousands of miles from the devastation in southeast Texas, the campus of Franklin Pierce University in Rindge, New Hampshire, is now a safe haven for undergraduates suffering from the wrath of Hurricane Harvey. "We have ice storms in New England. But they don't devastate us in the same way that a hurricane of this kind of flooding does," President Kim Mooney said. The school says for the fall semester, it plans to accept 20 students who have been displaced by the storm, picking up the tab for their tuition, room and board and fees. 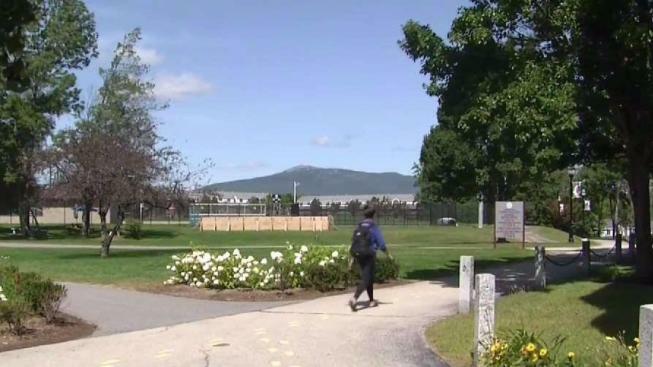 The total cost to Franklin Pierce: $24,000 for each student. "We had an opportunity to help so we took advantage of it and we hope students come," Mooney said. The awful images of flooding helped prompt the school to act. But in 2005, following Hurricane Katrina, 14 Louisiana students came north under a similar arrangement. "It was really good for them to be able to come away and regroup and just experience a calm setting where they could think about their academics," said Mary Kelly, a history teacher at Franklin Pierce. Schools in the flood zone have been contacted. So far, there have been no takers. Still, on campus, they are prepared to help. "Franklin Pierce is like one big happy family, as cliche as that sounds," said senior Sarah Flynn. "It's really true."